Reproduction of the CD format, from players and streamed from internet suppliers, like Qobuz and Tidal, has come a long way and can rival vinyl for musical enjoyment – with the right equipment. It does need additional care – especially to minimise contamination from mains pollution, high speed processing and RFI – but results can be awesome. About special care – read the side bar below. One big potential problem with all digital reproduction is hard-edged sound, caused by interaction with vicious mains pollution and airborne Radio Frequency Interference (RFI). Whether you are in a city or the Outer Hebrides you are swathed in transmissions from mobile phones, TV and radio broadcasts, police radio, airline traffic etc. – from kHz to GHz. Another problem is modern chips which run very high-speed processes, such as upsampling, that generate RFI inherent with high-speed switching. Their algorithms are also prone to “glitches” which they overcome – by guessing what’s missing! Read more below. Is there a solution? – read about the Quiescent Streamer. This astonishing music source implements ground-breaking technology to tackle the range of pollution problems. The result is a quality of sound most audiophiles have never heard. The D to A converter (DAC) in the player (or a separate component) is processing very high speed music data right into the radio frequency spectrum and “sees” RF pollution that leaks in as part of the music signal. The rubbish gets mixed in with the music and the result is the glassy, hard-edged high frequency nastiness that’s wrongly dubbed “digital sound”. It’s not the fault of the digital process but of the pollution around us. At the very least we recommend some mains filtration, that will benefit the whole system, using one of the Vertex AQ Jaya series, but there are two better solutions: one is a Taga distribution block that incorporates filtration for every socket plus their trademark acoustic energy absorption – see Mains<Vertex AQ – and the second, much more capable solution, is the Balanced Power Supply from the Vertex spin-off brand, Quiescent. Balanced power offers huge improvements in supply that make equipment sing. Musicians suddenly play exactly together and the performance flows, the difference between a first rehearsal and years of experience. See also the stand at the top of this page, the LeadingEdge rack. It look like just attractive furniture but there are four protective functions at work: isolation, energy dumping into the platform, acoustic absorption and, crucially here, RF absorption in the platform and in the Mini Panels at the sides. Many audiophiles have become disillusioned with results from computers and streamers. The realism is not “there”, audible imperfections grate on the ear – endemic in the processing unless treated – and technical standards have yet to be established, which makes listeners chary about investing. Normal computers are definitely not high audio quality devices, with very noisy power supplies and circuit components never designed for audio use. Spinning hard drives that offer large storage capacity are another source of damaging electrical noise. Solid state drive (SSD) prices drop as capacity is increasing to make them a better, much quieter alternative. Large spinning drives can still be used for “off-line” storage, sending music files to an SSD as a buffer. Just as with CD replay, radio frequency interference is a major bugbear with streaming music. Sources are obviously external radio transmissions but many audiophiles don’t realise that signal processing within the equipment is at least as damaging. Modern chips run very high speed processes – programmed into their structure – to offer facilities such as upsampling. Two problems with this: high speed processing is high speed switching – ON/OFF at frequencies in the MHz – which sprays out RFI, and secondly the mathematical algorithms in their internal programming contain faults, or “glitches”, manufacturers’ literature explains this. To compensate, so that the “checksums” add up, the chips interpolate digits that are guesses! Our amazing ear/brain combination hears these faults and it spoils our enjoyment. The processing is built into the chips and cannot be turned off. We have coined the term “busy chips” to describe these problematic components. Is there an answer? Yes, curiously to go back to early-generation chips with minimal processing. Our major supplier Vertex built their superb Aletheia DAC (hifi+ review) around a very simple chip, also used by a small number of other companies, but then treated the circuitry to huge amounts of their RFI/EMI and energy absorption technology for spectacular performance. There’s a helpful guide dCS_Guide_to_Computer_Audio that explains well some of the confusing terminology, eg kHz or kS/s? Under the News tab above read reports from shows where we have used high-resolution computer music with great success (and care! ), receiving “best sound in the show” comments from visitors. Vertex tech – what is it? It cleans out pollution from your system, some from outside but a lot is self-generated, within the system. Move a cable or a circuit in a varying magnetic field and it generates a current – the underlying principle for transformers, motors and loudspeakers. Turning the principle round: components resonate and create spurious signals – ‘microphony’ – when they suffer vibration from loudspeakers and transformers, those signals then carried throughout the system by the metal cables. The other major bugbear is Radio Frequency Interference, from mobiles, police, radio, TV etc, that creeps in from the mains and is picked up by cables. Their combined damage creates a hard sound, destroys detail and imaging and spoils rhythm and timing, that crucial toe-tapping response when you join the performance and become involved. No conventional upgrading can repair a damaged music signal. Vertex technology has impeccable scientific credentials, filtering down from non-destructive testing of aircraft structures and minimising interference between tightly-packed avionics in fast jets. 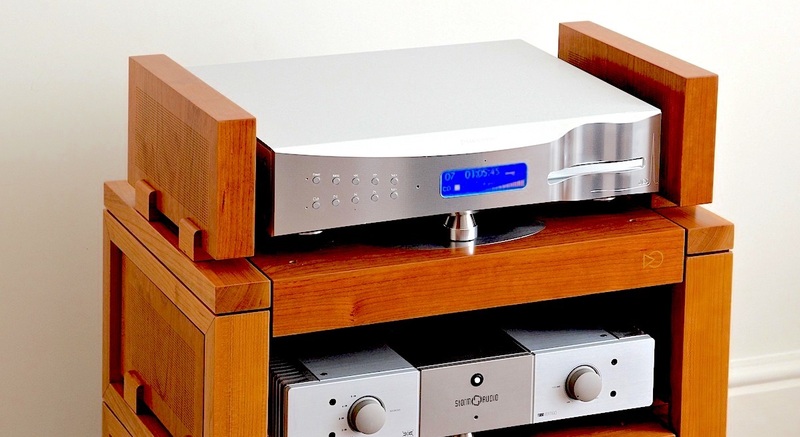 For hifi applications their power supplies, filters, cables and supports have been applied outside the main system components for more than 20 years, to absorb vibration and RFI – much of it internally generated – to the delight of hundreds of customers. Both types of pollution seriously downgrade performance. The superb performance of the Vertex Aletheia DAC and their Balanced Power Supply, fully-treated internally with their vibration and RFI/EMI absorption technology, triggered Vertex to form Quiescent to develop a full range of electronic components.